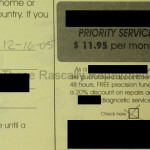 An inflated repair price is one thing, but there was an even bigger problem: Not one part of their diagnosis was true. I pulled the heat exchanger out and inspected it (third picture). The rusty things you see on top are just baffles. 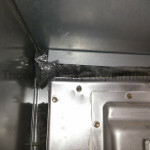 The light grey and dark grey metal is the heat exchanger. The dark spots certainly look bad, as though the metal has been damaged. However, those spots are normal. Aluminized steel naturally turns dark. I know it. Wiki knows it. Equinoctial should know it. 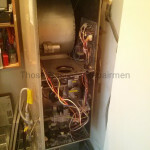 After doing the visual inspection I put the furnace back together. 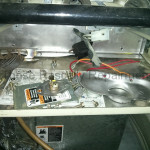 As you can see in this video, the furnace fired up without a problem. Not only is the heat exchanger fine, the supposedly bad blower motor and gas valve are also humming along nicely. 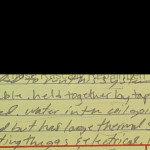 I get reports of this “gut the furnace and scare the homeowner tactic” with ever increasing frequency, all perpetrated by highly rated and supposedly reputable companies. 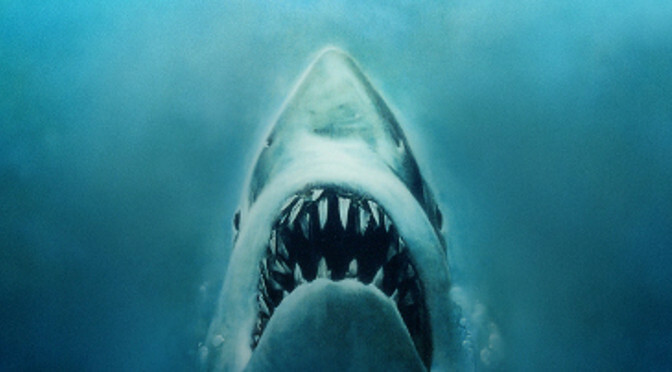 You could say there’s money in the water and the feeding frenzy is upon us. A little shaking… a little tenderizing… and down your wallet goes. Two years have passed since the original post. 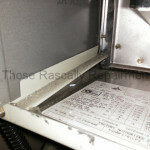 In that time I’ve talked with many homeowners who’ve experienced the furnace flaying frame-up described above. 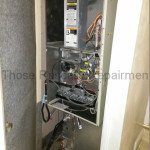 Most I spoke with told the repairman to put the furnace back together and then called me for a second opinion. 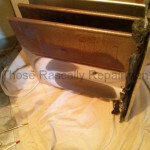 The owner of the furnace pictured below did the same after Heroic Heating gutted her furnace. 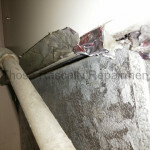 But in this case the repairman couldn’t put it back together properly. 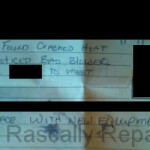 He blamed the original installers for his mistake and recommended a new furnace. The pictures below tell the rest of this fishy story. After the homeowner presented them with three reports that essentially said “Heroic is full of it.”, Heroic relented. 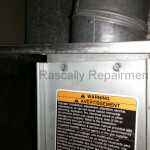 They pulled the furnace out, assembled it correctly, reinstalled it and replaced a couple of parts all for free. It’s an unusually good ending, but this homeowner is unusually tenacious.